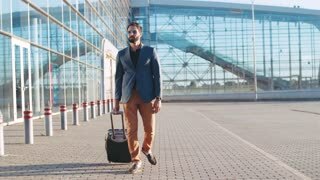 Young stylish bearded man in a suit walking to the airport, pulling suitcase and answering his phone call. Business style, active lifestyle. Traveling time. Stylish young bearded man in sunglasses exiting the airport terminal with luggage, talking on the phone. Business style, traveler, modern lifestyle. Active lifestyle. 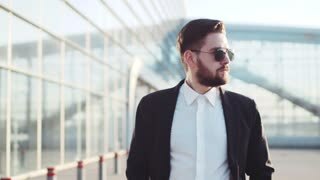 Stylish young bearded man talking on the phone while entering the airport terminal with luggage. Successful life. Business style, traveler, modern lifestyle. Active lifestyle. 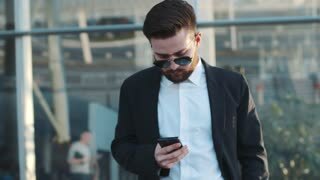 Rotation view of a young bearded man in sunglasses standing by the airport terminal and using his phone. Business lifestyle, active lifestyle, modern man. Joyful mood. 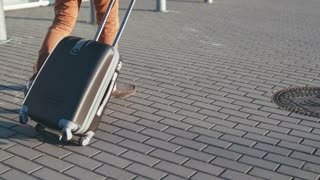 Young stylish man in sunglasses talking on his phone, and pulling suitcase while exiting the airport. Successful life. Business style, traveler, modern lifestyle. Active lifestyle. 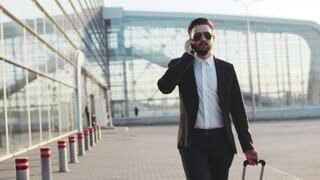 Stylish young bearded hipster in a suit answering the phone call while walking near the airport terminal. Being a professional, successful lifestyle. Male portrait. 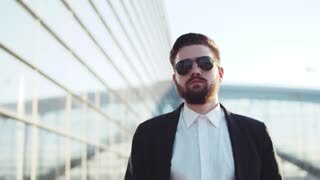 Handsome bearded man in sunglasses walking near the airport terminal, answers the phone call, nodes. Stylish elegant outfit. Being a boss, successful lifestyle. Making money, business travel. 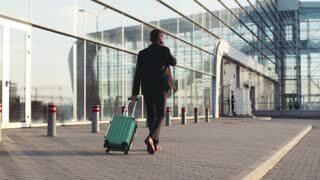 Young bearded man in casual wear and sunglasses in hurry pulling the suitcase to the airport entrance, checks the time. Active lifestyle, business trip, first class passenger. 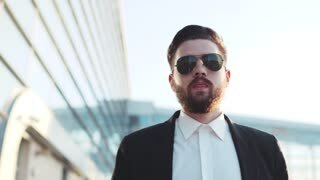 Young bearded man in sunglasses having a business trip, pulling the suitcase to the airport. Active lifestyle, having vacation. Modern airport on the background. Self-confident hot young blonde girl in an elegant formal black suit walks by the airport terminal and uses her cellphone, looks around. Stylish outfit, modern woman. Business style, active lifestyle. 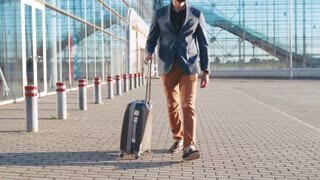 Self-confident handsome bearded man in fashionable suit pulling the suitcase to the airport terminal. Business trip, successful lifestyle. Business appointment, being a boss.